PICNIC is a luxury yacht with presence. Exterior styling with dark tapered windows gives this yacht a head turning command at every port. 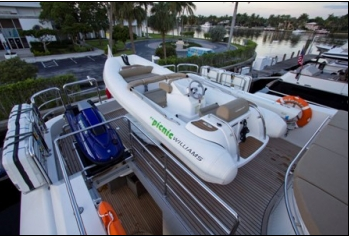 PICNIC will make her debut at the Florida International Boat Show, Oct. 27 to Oct. 31, 2011, maneuvering into position as a top yacht on the charter circuit. 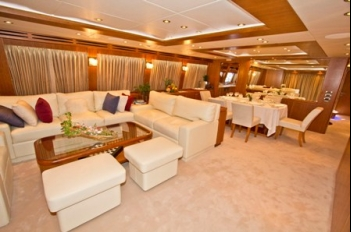 The salon and dining area on board PICNIC is spacious and serene. Elegant and understated, contemporary furnishings work as perfectly for casual conversation and cocktails as for formal five course dining. Guests have the option of al fresco meals on the aft deck or relishing the beach house feel of banquette seating around the ample table on the flybridge. 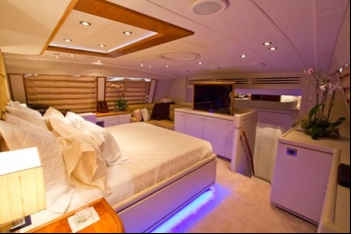 PICNIC is a custom Monte Fino 100, stylishly appointed with charming attention to detail. Playful neon and indirect lighting adds a dash of fun, while fine china and superb linens please charter clientele who expect the highest standards of quality. water toys to please all guests, whether they enjoy the thrill of Seabobs or the enchantment of diving below the depths, water skis or Jet skis, the onboard toy chest will not disappoint. PICNIC will be located at the Hargrave/Monte Fino display at Las Olas docks, A Dock – Slip 7, during the Fort Lauderdale show. Follow this link for additional information on PICNIC. Find useful information here about Caribbean Yacht Charter.